Editor's note: This is number 30 in a series of posts by Dennis Horne, sharing quotes from his book, Determining Doctrine: A Reference Guide for Evaluating Doctrinal Truth. You can read the introductory post here. The first part of each post is a new introduction, placing the quotes in context with contemporary issues. The quotes that then follow are from the Determining Doctrine book, which contains many quotes that are not readily available elsewhere or are exclusive to the book. If it comes from an activist or protestor it is likely plain nonsense. If it comes from a prophet or apostle it is likely eternal truth. When one is not sure, it is well to remember that the current practice of the Church constitutes the interpretation of the scripture. If a leadership handbook says something, even if loud people don’t like it or it is not popular, that is still the current interpretation of the scripture. Too often we hear, “why do the Brethren..?”, or, “why does the Church..?” Instead of, “why do the scriptures teach..?” or, “why does the Lord say..?” We need to remember that when the First Presidency and the Quorum of the Twelve speak with a united voice it is the voice of the Lord for that time. . . . So I am saying to you, when you step out into the noisy world, keep your eyes on us. We will not and cannot lead you astray. Do not ever follow those who believe they know more than Heavenly Father and the Lord Jesus Christ about the administration of the affairs of Their Church here upon the earth. . . .
You will be going out into a noisy world. This noisy world will have some things to say that are nice about the Church and they will have some things [to say] not so nice. There will be those who want to tamper with the doctrine, but you don’t listen to that because you stay anchored to the fundamental doctrine and gospel of Christ. May God bless you with the courage and the strength to stand wherever you are serving and whatever your circumstances may be—that you may stand never never ashamed of the gospel of Jesus Christ; never with a wonderment or concern about the leadership of the Church. We are led by a prophet; there are fifteen apostles on the earth. We meet together. And I said earlier, we cannot and we will not lead you astray. Keep your eyes upon us. Keeping our eyes and ears on the First Presidency and the Twelve will help us to learn to interpret the scriptures correctly for ourselves and also how they interpret the scriptures for the Church. Their interpretation, their teachings from them, are what is important to us, even more so than our own. How many people have stubbornly become interpreters of the scriptures unto themselves, private interpreters so to speak, and have thereby lost their standing in the Church? How many others have learned to study and understand the scriptures correctly and in harmony with the prophets and will be eternally blessed and benefited thereby? No wise member of the Church with a sound understanding and a stable testimony would deliberately set forth to use the scriptures and quotations from the Brethren to prove and establish as he supposes, any basic doctrine that is known to be in conflict with the teachings of the Brethren and that has been announced by the Presidency and the Twelve officially as being false. This is a very perilous course to pursue. It is destructive of faith. When such information comes into the hands of spiritually immature people it can have no effect other than to sow seeds of doubt and uncertainty in their minds…. Second: every verse, whether oft-quoted or obscure, must be measured against other verses. There are complementary and tempering teachings in the scriptures which bring a balanced knowledge of truth…. Discussions frequently arise over the meaning of isolated texts of scriptures, most of which would find interpretation in other passages of holy writ. Some of them are needless and unimportant, and these should be avoided; but it is proper to study and arrive at correct conclusions as to the meaning of that which is written for our learning and edification. 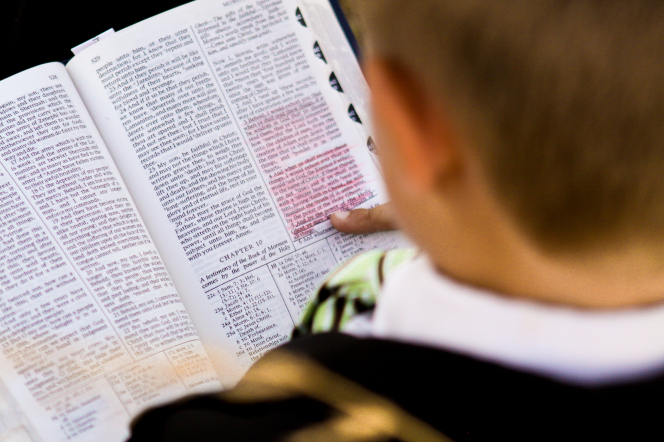 The published standards of the Church, as has been frequently announced, are the Bible, "so far as it is translated correctly," the Book of Mormon, the Doctrine and Covenants, and the Pearl of Great Price. They have been so accepted by the Church in conference assembled. Thus we have something at hand which can be appealed to as authority in doctrine. The Lord has also appointed one man at a time on the earth to hold the keys of revelation to the entire body of the Church in all its organizations, authorities, ordinances and doctrines. The spirit of revelation is bestowed upon all its members for the benefit and enlightenment of each individual receiving its inspiration, and according to the sphere in which he or she is called to labor. But for the entire Church, he who stands at the head is alone appointed to receive revelations by way of commandment and as the end of controversy. Assisted by his counselors, he presides over the whole Church in all the world; thus the First Presidency hold the right to give authoritative direction in all matters that pertain to the building up and government and regulation of the body…. There are questions relating to doctrine and principle that are proper subjects for class discussion, when that is conducted for the purpose of gaining information. There are topics, however, that are of no particular moment, or on which no definite conclusion can be authoritatively reached, and these ought to be avoided, as a waste of time and a cause of endless dispute. Let the light shine and be sought for in faith, but let contention have no place among the Latter-day Saints! We frequently look about us and see people who incline to extremes, who are fanatical. We may be sure that this class of people do not understand the gospel. They have forgotten, if they ever knew, that it is very unwise to take a fragment of truth and treat it as if it were the whole thing.